The new interim City Manager for Cedar Springs is someone who likes to spotlight the good things going on in a community. And she hopes to bring some positive things to Cedar Springs. 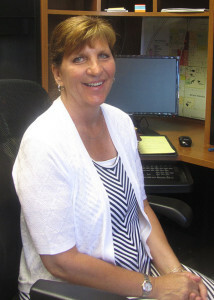 Barbara VanDuren, of Wyoming, was hired last Thursday evening and started work this week at Cedar Springs City Hall. She retired in 2015 as deputy city manager for the City of Wyoming, a community of 72,000 people, with a budget of $105 million and 350 employees. She was responsible for economic development, downtown development, and working with local governments and citizen groups for the betterment of West Michigan. She held that position for 15 years. During four years of that time, she also taught undergraduate public administration courses in local politics and administration, and public personnel policy. Prior to that, she was City Manager for the City of Wayland from 1996 to 2000, and assistant city manager before that for three years. It’s not the first time she’s seen Cedar Springs. She and her husband, John Crofoot, live in Wyoming, but are avid bike riders, and sometimes ride the White Pine Trail to Rockford and Cedar Springs. “The White Pine Trail is a beautiful trail,” she said. They belong to a trail riding group, and do some recreational biking on the weekends. This fall they plan to take a bike tour through Vermont. “It was one of those things on my bucket list for when I retired,” she explained. The couple has two grown children, Eric and Kevin. Both are married and live in the Grand Rapids and Grandville areas. They also have a 5-year-old grandson, Elliot. “I have always seen positive things happening that don’t get publicized,” she explained. “But I think that local government and schools have a heart for their city, and it feels good to be on the other side and tell those stories.” She works with WKTV on those commercials and they are also put on the city’s website. So what is VanDuren’s mission here in Cedar Springs? “Well, I’ve only been here a week, but I would like to work on improving communication between council and staff, and getting council and staff prepared for a new city manager. And help, if I can, to bring in a new manager that’s just right for Cedar Springs. I would like to keep things moving in a forward direction,” she said. VanDuren said that her door is always open if a resident wants to talk. She will usually be in the office Monday through Thursday, 8:30 p.m. to 3 p.m. The City Council will meet Monday, June 6, in closed session, to review candidates for the permanent position. The former City Manager, Thad Taylor, left for a position in Manistee in November. City Clerk, Linda Christiansen was acting City Manager from that time until VanDuren was hired.